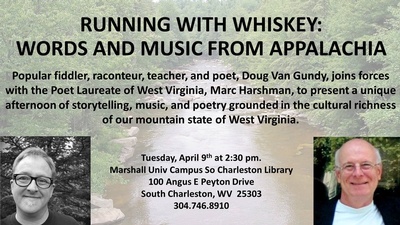 Popular fiddler, raconteur, teacher, and poet, Doug Van Gundy, joins forces with the Poet Laureate of West Virginia, Marc Harshman, to present a unique afternoon of storytelling, music, and poetry grounded in the cultural richness of our mountain state of West Virginia. The afternoon includes a taste of true “old-time,” traditional music from this state where Elizabethan English persisted longer than in Elizabethan England. Van Gundy and Harshman also present music and poetry that represent the contemporary concerns and joys of this resilient land and its people.